It's been a pretty interesting day so far. Some obvious stuff, some old stuff, but also some good stuff. 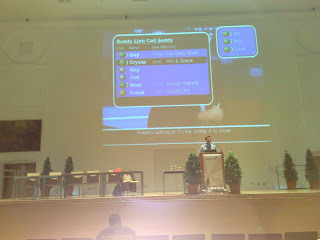 For me, one interesting session was the one on mobile tv. Research shows that we should NOT promise or advertise mobile tv as 'tv in your pocket', as this gives the wrong reference to people - they compare it to normal television, and for many reasons, technical and user experience ones, mobile tv falls short. We need to give users other reference points. Nokia had done a test with 24 people in Dublin over the weekend - Nokia people - sending live videos to friends and family, and also to youtube. A good idea, but as only 11 of the 24 managed to send videos, and these people were from the company mind you, it goes to show that the usability and technical issues are still very much something that needs to be worked on. From Japan there was some results showing that people use mobile tv without sound, with subtitles and no headphones. Short entertainment was the most popular genre. Right now we're listening to 'social television'. Some nuggets here as well, though not many so far. Salzburg is 30 degrees right now, next to no wind, all in all pretty stifling. Here's hoping for a thunderstorm a bit later!